"This is a nutritious and delicious breakfast cereal. Use any type of dried fruit you desire! You can also use almonds in place of walnuts if you like. Wonderful when served in bowls with milk and fresh berries or sliced fresh fruit." 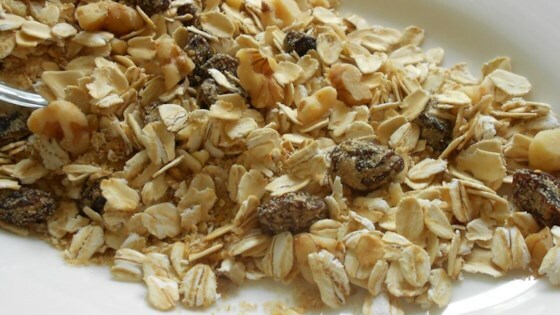 In a large mixing bowl combine oats, wheat germ, wheat bran, oat bran, dried fruit, nuts, sugar, and seeds. Mix well. Store muesli in an airtight container. It keeps for 2 months at room temperature. Whoops! I'm so use to giving good reviews that I mistakenly rated this a 5 when I entended a -1.